The origin of this popular South African is unknown. 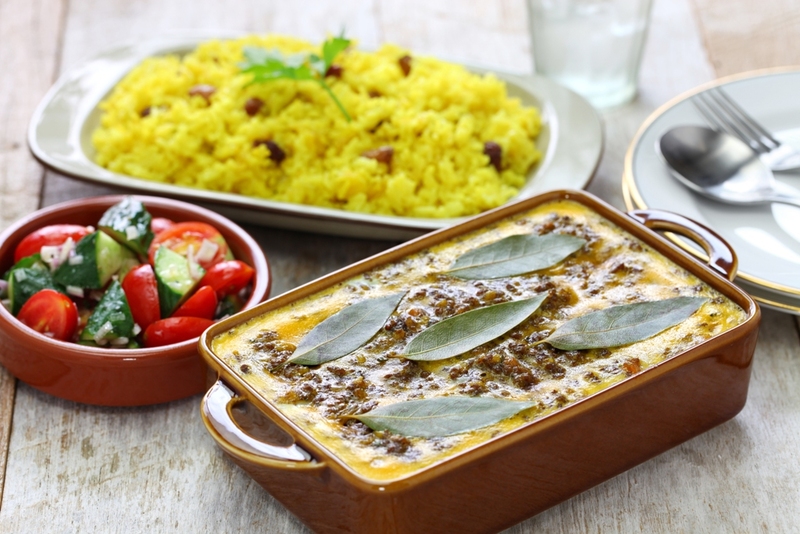 Bobotie was most likely influenced by the Malaysian and Dutch cuisine. This creamy meat pie balances a sweet-sour-spicy flavor. The fresh lime leaves from the authentic recipe are usually substituted with bay leaves. Lemon thyme comes closer to the authentic flavor and fills the kitchen with a fragrant smell. In a small POT, heat 1 tbsp oil. Fry 1 onion on medium heat until golden. 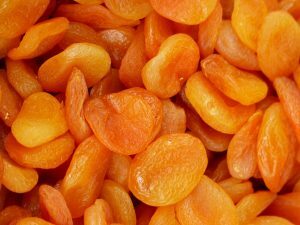 Add apricots, ginger, 1/4 cup vinegar, 1 cup water, sugar + salt to taste. Cover and cook over low heat for 30-60 min. Add chopped almonds and/ or 1 oz raisins to the meat. Substitute meat with lentils or chopped mushrooms. Garnish with fresh leaves (bay, curry, or basil). Add an apricot-ginger-chutney as a side (see recipe above). In a PAN, heat 1 tbsp butter. Fry onions over medium heat until golden. Add meat, salt to taste, and Bobotie Spices . Stir-fry meat until it is crumbled and cooked. In a CUP, whisk 1 egg and mix it with a 1/2 cup of milk. Add it, sugar, and almonds to the meat. Mix well. Stir in vinegar and lime juice. Adjust salt. Fill into a non-sticking BAKING DISH. In a BOWL, whisk 2 eggs. Mix it with 1 cup of milk, salt to taste, and Bobotie Spices . Bake in the OVEN for 30-40 minutes until topping is no longer liquid and turned slightly brown. Serve with rice, and optional chutney and/ or a salad of your choice.